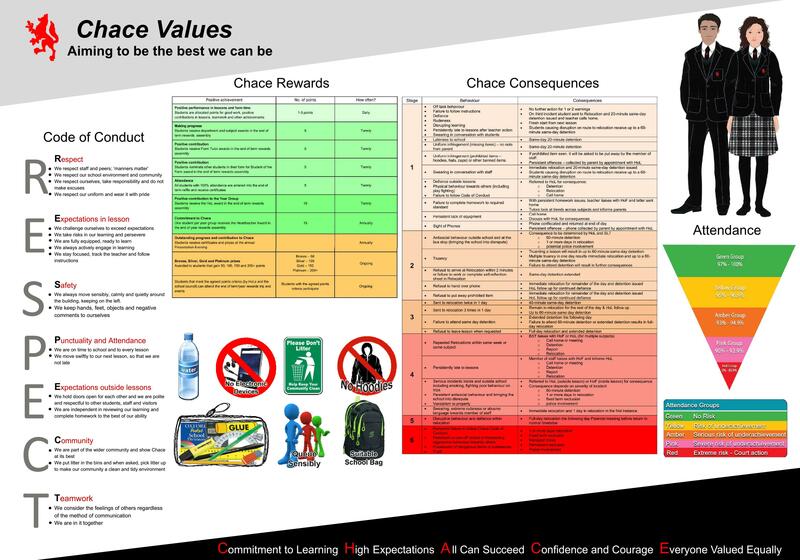 We are committed to developing Chace as an inviting, purposeful, successful learning community, working together to improve learning and teaching and to raise achievement to enable all our students to meet, with confidence, future challenges. We recognise that 21st Century learners will increasingly learn alongside and with new technologies and we want them to be safe online. – Appropriate and cutting edge resources can be accessed whenever and wherever they are needed, including from home. – Learning is enhanced by a range of personalised opportunities using ICT both in and out of the classroom. – Students are e-confident, prepared for the digital age in the workplace and further learning. – Setting out the key principles expected of all members of the school community with respect to the use of ICT-based technologies. – Assisting school staff working with children to work safely and responsibly with the internet and other communication technologies and to monitor their own standards and practice. – Setting clear expectations of behaviour and/or codes of practice relevant to responsible use of the internet for educational, personal or recreational use. – Having clear structures to deal with online abuse such as cyberbullying which are cross referenced with other school policies. – Ensuring that all members of the school community are aware that unlawful or unsafe behaviour is unacceptable and that, where appropriate, disciplinary or legal action will be taken.